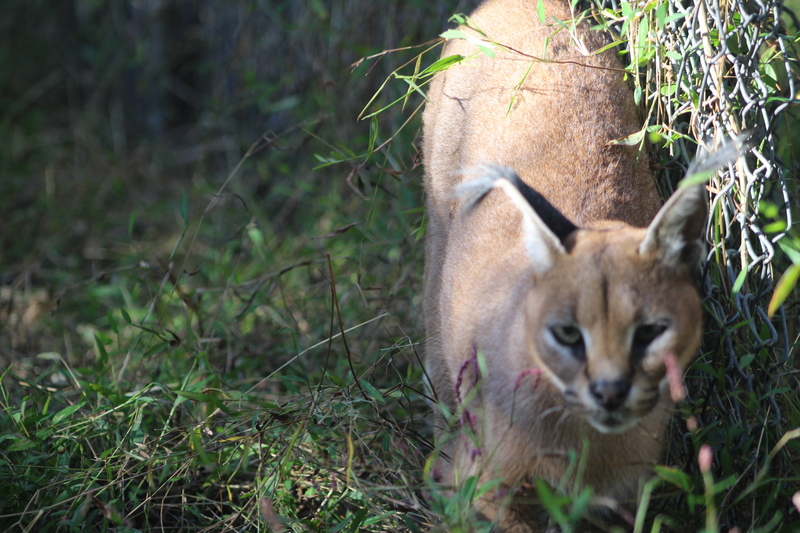 Zari can be a very shy caracal who sometimes takes time to come up and visit guests. Although she is not as talkative as Kitwana, she still has a lot to say. As she has grown more comfortable in her new home at Carolina Tiger Rescue, she is starting to really come out of her shell! 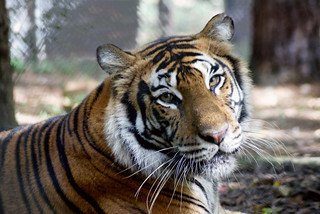 Zari came to Carolina Tiger Rescue with her enclosure-mate, Kitwana, and fourteen other animals from a facility in Colorado. The owner decided to sell his land and donate his animals when he became ill. Carolina Tiger Rescue worked with several other sanctuaries around the country to find homes for over 100 animals. This is the largest rescue to date in Carolina Tiger Rescue's history and the largest rescue of big cats in the United States. Zari can sometimes take awhile to warm up to new people and other times she is out and up at the fence ready to greet them. She is a feisty caracal who loves to quarrel with her brother, Kitwana. Zari is enjoying her new home and runs around from shift to shift without a care in the world. 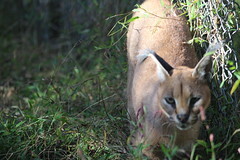 Zari is the smaller of the two caracals that came from out west. Her left ear tuft mostly stands straight up, while her right ear tuft folds over like a broken party hat.  She has a darker coat than her enclosure-mate, Kitwana. Zari and her enclosure-mate, Kitwana, live in Pear Orchard on the tour path across from Sheba and Sebastian Lions. They live next to Electra Caracal and in front of Savannah Serval. 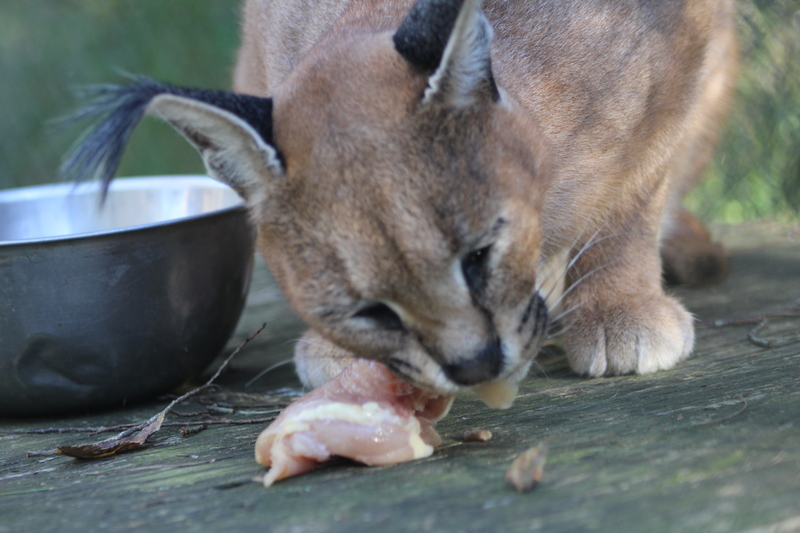 Caracals, like Zari, are very adaptable cats, however the biggest problem they are facing in the wild is habitat destruction. 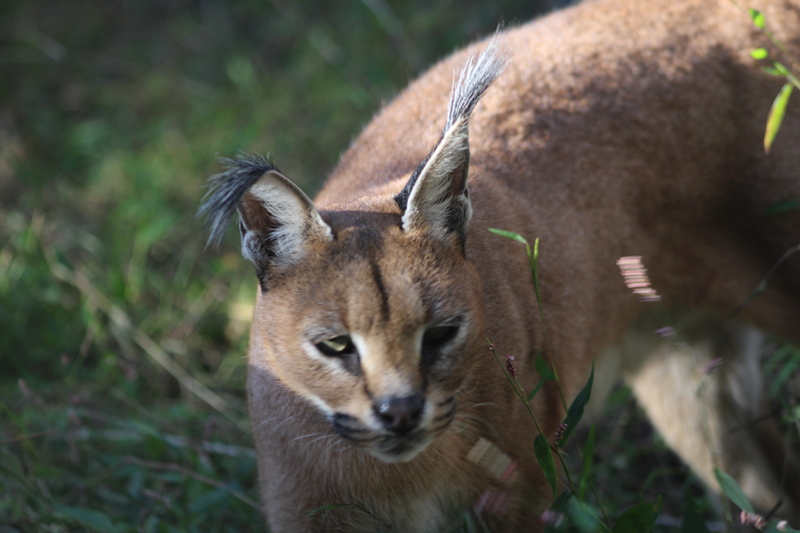 Habitat loss is the number one reason the caracal population is declining. Habitat loss is directly due to the growth of the human population, urban sprawling, and the need for more agricultural farms that require vast amounts of land. It is not only the caracal that is affected by habitat loss, but also its prey. Many migratory species are unable to complete their migration due to urban developments and this has a direct impact on the land and the predators who hunt them. 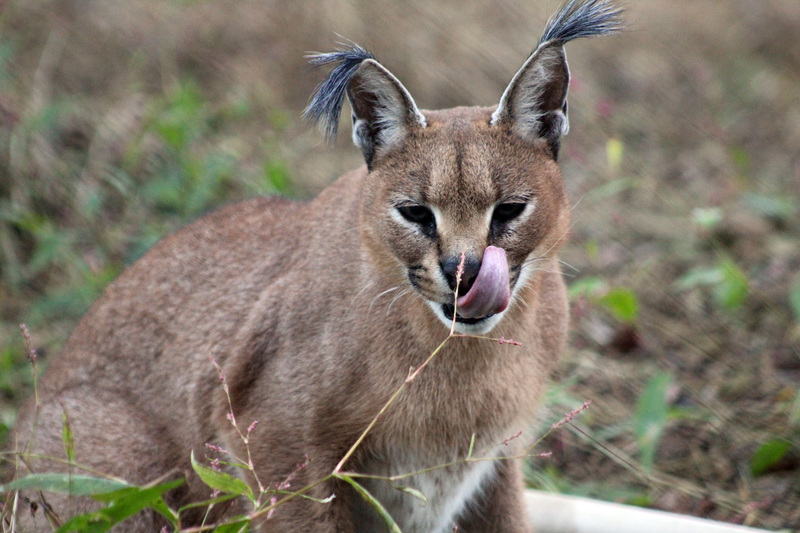 It is vital that lands be protected so animals such as the caracal can continue to thrive.